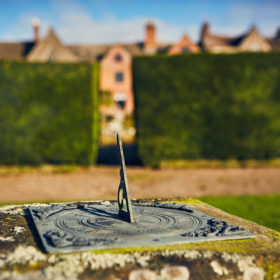 Boasting the same English elegance as Brideshead, Broadstone Court sits where the best of England meets the best of Wales. Gather your folks or hens together and invade the games room. Play a little pool. Fire pizza in the outdoor clay oven. Revel in the local festivals. Attempt to leave. 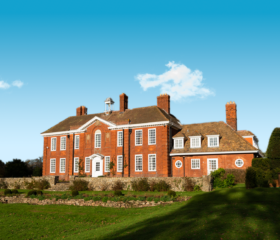 Broadstone has bags of sumptuous period detail; infinity lawns; character, poise and promise of English elegance. 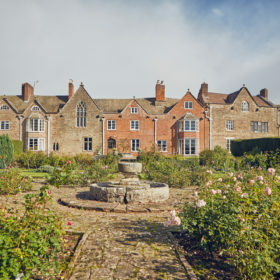 Where England becomes Wales, in the rolling hills of Herefordshire, Broadstone Court is a place where people become man and wife. 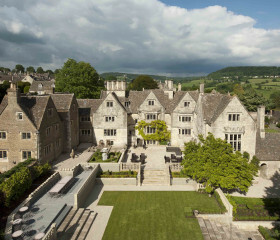 You don’t have to get married to stay here, but you might feel like young lovers again. Young lovers who’ve brought all their friends and family to share in their story. 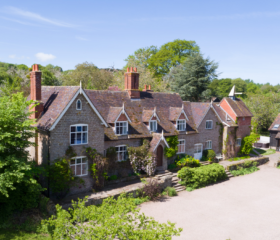 This is a rural idyll, set in 22 acres at the end of the tree lined driveaway that suits a fleet of Bentleys, although that’s not a requirement. Inside, stunning heritage features gel perfectly with modern home comforts. With a huge games room, bar, library and pool table, it’s a special spot for special gatherings. This is a place to meet on the terrace around the firepits. To fire pizza in the clay oven. To wander the rose garden, woods and orchard. To pull a book from the shelf and unwind within its pages. To leave only to revel in local arts and music festivals. Or to chill in chatty groups in the many lounges and catch up on your box sets. 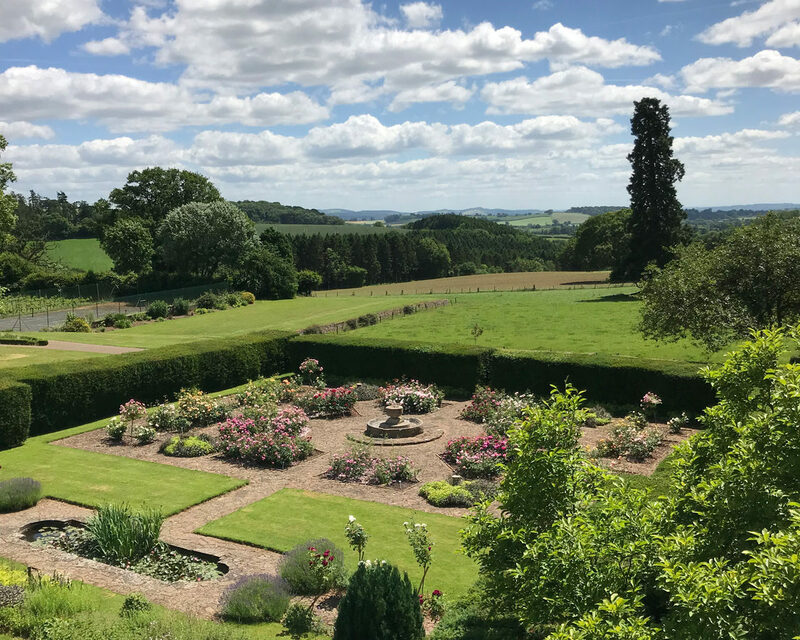 Within the grounds of Broadstone’s 22-acre estate lies 5 acres of south facing luscious lawns, a David Austin rose garden, walled kitchen garden, orchard and woods. Nothing stirs here apart from the odd snuffling hedgehog or the occasional rustle of a woodpecker alighting from the trees. 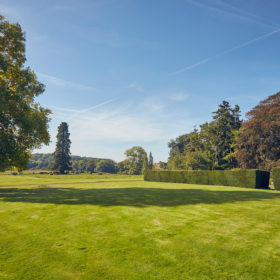 Enjoy a little croquet on the lawns, or play your own test match. Explore the woods, kitchen garden and grapevines. 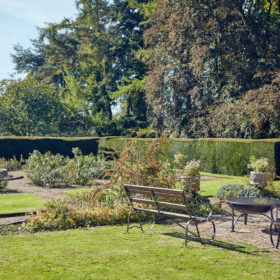 Organise a treasure hunt for the kids or a picnic by the fish pond. In the evening, throw a cardie on, light the terrace firepits and get some pizza going in the clay oven. 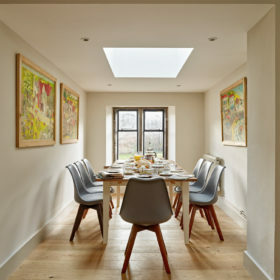 Welcome to the world of sympathetic renovation. 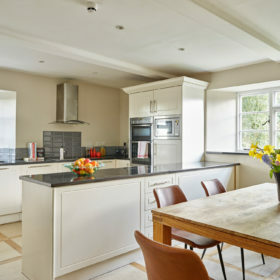 The house might be 14th century and groaning under the weight of its heritage features, but it comes with all the mod cons you’d want for contemporary living. 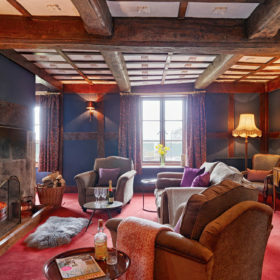 Relax in the luxurious lap of wood-panelled walls, exposed beams and cosy open fires. 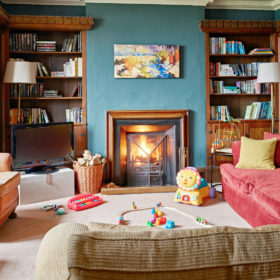 In the evenings, pick a lounge – any lounge – raid the stack of logs, and get the wood burning and the chatter flowing over drinks. 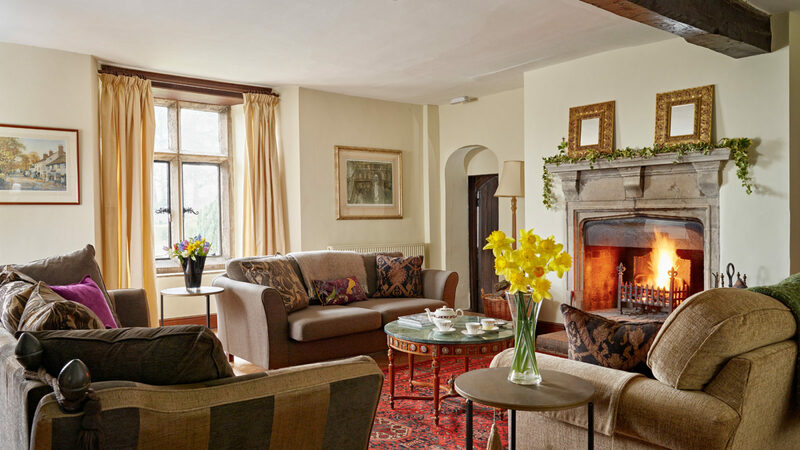 Or head to the snug to bond over movies, matches or box sets. Raid the DVDs, play your sounds through the soundbar or get competitive on the Playstation. 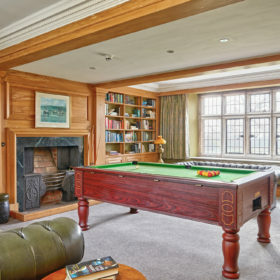 The library’s great not just for burying yourself in a book on the Chesterfield, but also for pulling a cue from the rack and potting some pool balls. Need more fun and games? A second playroom sits above the bar. Play a little ping-pong, let the kids loose in the play area or settle back in the cinema area with DVDs. Broadstone offers the chance to relax in the lap of luxury, among the people who matter the most. 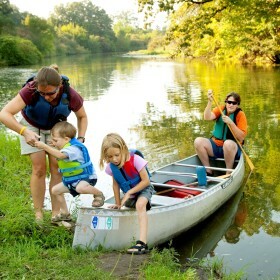 Get them all together, slip away in small groups, or duck out for a little me time. 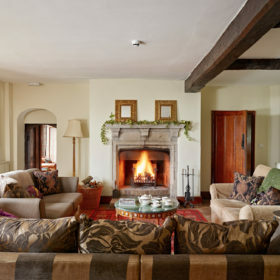 Reception rooms here are fun, flexible affairs lit by log fires and warmed by the glow of good company. Herefordshire is a crucible of culinary delights. 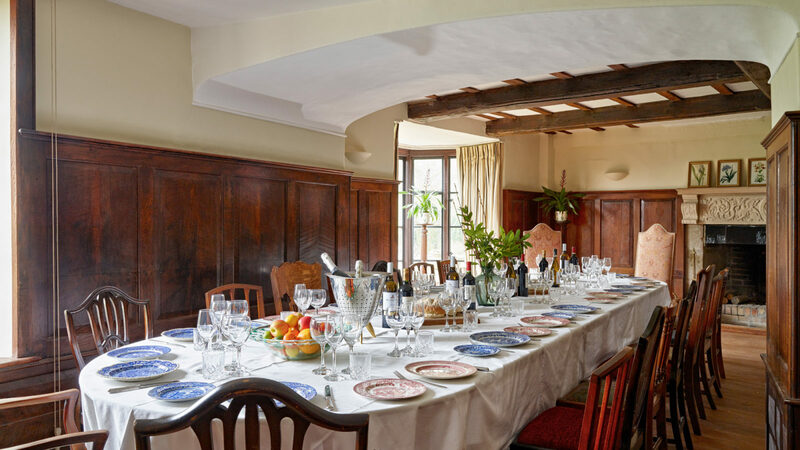 The rich land gives up some of the finest fare in the country, from Herefordshire beef to cider and apple juice, and from Monkland cheese to Chase gin and vodka. Even Tyrrell’s crisps, well-known for leaving their jackets on, are a product of the superior local potatoes. Head out and about to take a tour and taste the local wine at the Three Choirs Vineyard and Black Mountain Vineyard. What will you be washing down? Maybe Beef Wellington followed by cider cake prepared in the double oven with electric fan and five-burner hob with electric induction. 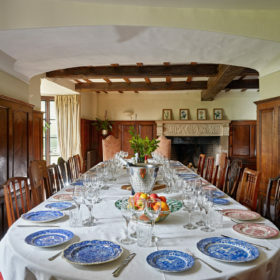 Is the oak panelled dining room big enough? We think so. 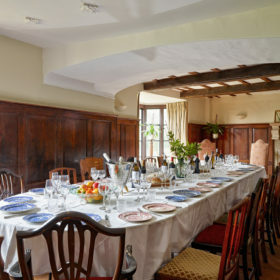 It can comfortably seat up to 26 alongside the huge stone fireplace, while the breakfast-room table is good for small parties of eight to ten. You’ll get six to eight around the kitchen table, enough to chat with happily as you chop. Want to eat outdoors? 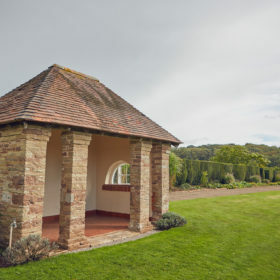 Head out to the terrace for the barbie or clay pizza oven. Taking it easy? 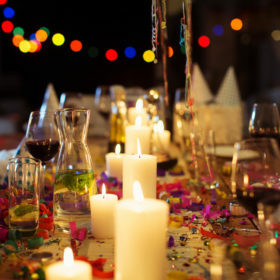 Let AtoZest do the heavy lifting, with everything from formal dining to drop-offs. 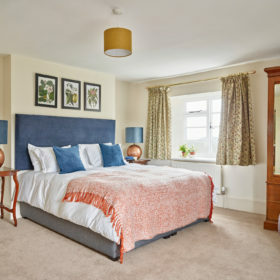 Ortuck into some pub grub at England’s Gate just five minutes away, or at gastro-pub The Stockton Cross 10 minutes away, The Bell at Tillington or The Cider Barn at Pembridge. 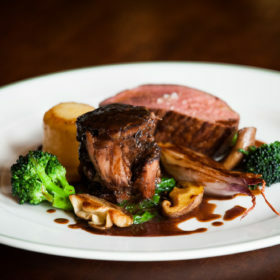 Head into Hereford for posh nosh at The Bookshop, The Black Dog or The Cellar Door. 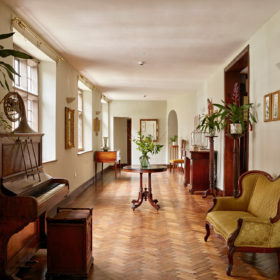 All nine bedrooms here are big, bountiful and beautiful, punctuated by period touches such as panelling and fireplaces. Exposed beams and rustic-oak doors abound. Wrap yourself in warm duvets and a blanket of silence. 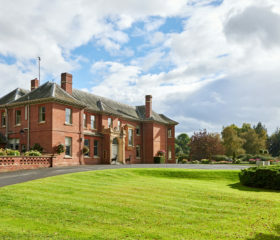 Broadstone sleeps 18, with more guests welcome in z-beds and cots. 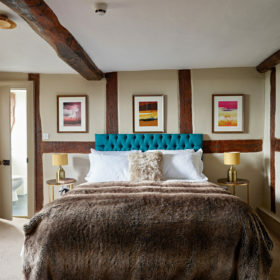 It all kicks off in grand style in bedroom one, with its king-size bed, ante room and shared luxury en-suite with grand walk-in shower. 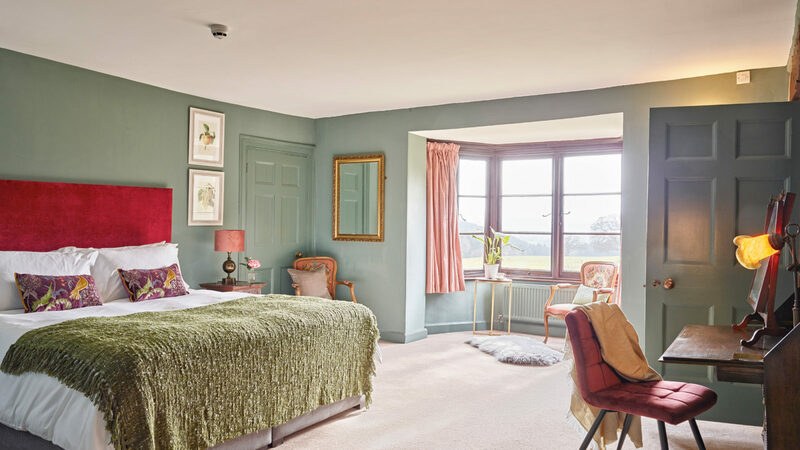 Savour the south-facing views through the mullion windows. 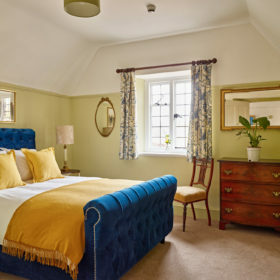 Bedroom two is another king-size sharing the luxury bathroom with bedroom one, while bedroom three is a zip-and-link superking with private en-suite bathroom with large walk-in shower and bay window seating overlooking the rose garden for that first coffee of the day. Bedroom four is a king-size offering a shared Jack and Jill bathroom with king-size bedroom five, featuring a large walk-in shower. Bedroom six is a king-size with adjacent huge art deco bathroom with a large walk-in shower, while bedroom seven comes with a private bathroom opposite with large walk-in shower. 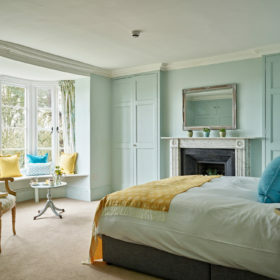 Sit in the window seat in the large bay window and gaze at the rose garden. Bedroom eight is a zip-and-link superking sharing a large bathroom including a large bath and separate walk-in-shower with bedroom nine, a double. Hitch a steam-train ride at Broomy Hill or Dean Forest. 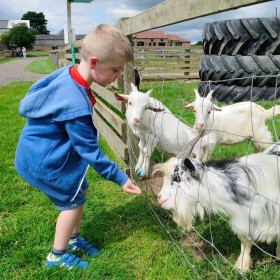 Ride the tractors at Newbridge Farm Park and make furry friends at Wynnes of Dinmore. Watch movies on squishy sofas at The Loft. Stay on site for archery and clay pizza. 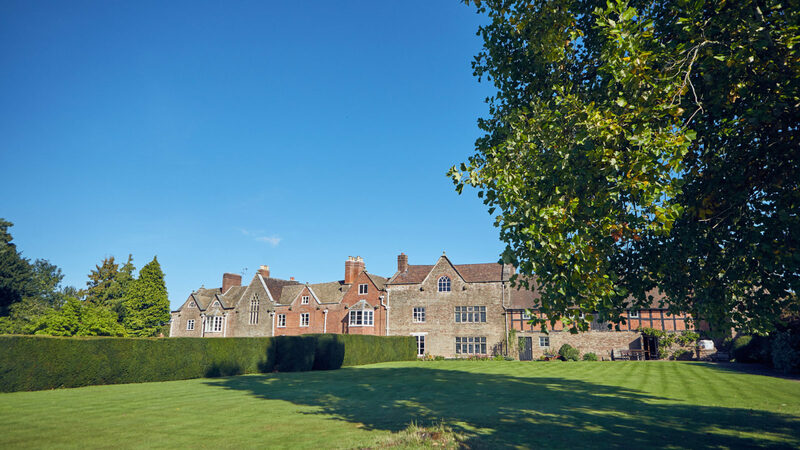 Go off-site for bowling, golf, canoes, and cheese and gin tours.